Looking for recommendations, I hunt rough grouse and released pheasants in Alberta Canada. I have had labs, Springers and a disastrous time with a gsp. I was looking at cockers,puddlepointers or pointing labs. That question begs another: do you want a personal trainer or a boot licker? Are you going to train it yourself or have it trained? I'm your age and have Brittanys but have to say it helps to be in top shape! The key is to have a well-trained dog; they do the work and you stand there or walk slowly behind. With a close working pointing dog you can stand there until the dog points, and then you go; that saves you some work. Flushers often work closer than pointing dogs, but you have to follow them all the time. 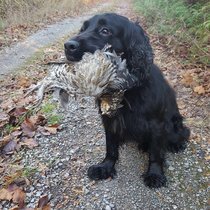 All things being equal, though, for a slower close working dog for preserve pheasants a pointing lab is a good choice, as might a standard poodle or a setter also be. Or get a dog of any breed that's finished (completely trained). Seriously, even a fast dog like a pointer can be trained to work pretty close and do all the work for you (it may not like it! ), but that's probably overkill on a preserve. I'm about 10 years older than you and I now find brittanies to be a bit too wide ranging and maybe a bit too fast for me. It is easier to buy a pup that is by nature likely to hunt fairly close and not too fast than it is to buy a naturally fast and wide ranging pup and then train it not to hunt so widely ! A friend bought a Bracco Italiano last year. She might be the kind of dog to suit you. Not particularly fast or wide ranging and easy to control. She also loves retrieving and will retrieve almost anything with just about no training at all. The breed seems to have a beautiful nature . I am liking this breed more and more even though I don't much like it's "heavy hound" looks. P.S. this breeds coat might not be good in your winters though . I would say pick "your" breed and work with them. I feel any dog bred to hunt could be a possibility. I never cared for the term boot licker or heel shiner Though I was often guilty of calling my dog "my heel shiner"...... but oh contrar he/they worked exactly as I had hoped they would. Close and in the game . Here in the part of NY I choose to hunt and call home a "big running dog" would be of no use for chasing grouse and the little russet fellow. I have run GSP's with great success . 35 ~ 75 yrds mostly ~ with ranges of 100-125 depending on terrain. I like pointy dogs . I have nothing against flushing breeds. This dog world would be a pretty boring place if we all liked "one" breed of dog. Zebo, I am well into my 60s and still find myself loving pointing dogs that some might find too much work. A part of that also requires that I myself stay in the shape so that I can bird hunt where/when I chose. I would rather hunt birds with my dogs than anything else so here's hoping the Big Guy gives me a few more years. As for "the breed for you", I suggest you get a Lab or a flusher (springer/cocker etc.). As suggested, a trained dog will expedite your aspirations if that's in your budget. The thing with flushers in my opinion, is that they handle ditch parrots better than most breeds because of their natural ability traits. They should handle with minimal intervention, pattern closely, flush within gun range, retrieve from land or water. Most of these traits come with well bred retrievers/flushers out of the box. Getting them to hold pattern and "hup" is where you might have to focus your efforts. Yes, most of the pointing breeds learn the habits of ditch parrots over time. "Time" is the key to getting a pointing dog where it need be and time, at our age becomes a very weighted entity. The training needs of a typical gun dog means there is more work and sometimes more $$$ into a competent pointer versus a capable flusher. As much as I still love my setter and pointer, I would prefer to hunt ditch parrots over a flusher or retriever - again, that's just me. Oh, and flushers/retrievers make fine grouse dogs too - a fact often under-stated. When you add in waterfowling which you have in spades in AB, you have the ultimate dog be it a Lab or flusher, me thinks! I know this is heresy to some...but in your situation, a pointing Lab might just be the perfect choice. You will have a dog that naturally has the tendency to stay close, will stop and stand for grouse, at least until you get there and not drive forward to the flush, and that is not afraid to go into cold water after a downed bird. The key is(obviously) to get the kind of dog YOU will enjoy hunting behind. You know you and your needs best. Keep that at the front of your selection process. I do agree that a dog that has been "well started" might be a bargain because you can go to the field pretty much right away and time is money, but again, that is your call. I would suggest an English setter. If you get a pup, you could train it yourself using the Burnt Creek Method of Dog Training by Jim Marti. Nothing wrong with a good flushing dog,and a lot right. Still, your first step is to decide if you want a pointing or flushing dog, and then to make decisions from there. I agree that a started (or even finished) dog has great merit. And you should also decide what breed you'd prefer AWAY from the bird field,as that's where you'll see the dog most. Size, coat , protectiveness, activity level and more are all genetic. Figure out what you want. PS If you are healthy , just choose the breed you want. Boykin, English Cocker or small pointing lab. 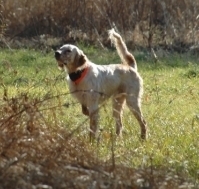 I have never watched one work except in video's but I believe at your point I'd try a French Pointing Griffon. I love pointing dogs, so that is what I hunt behind. I think it is a commonly heard misnomer that as we age we need slow close working dogs. I disagree with that completely if the intent is hunt wild birds. I think we need broke dogs which find, point and hold birds until we arrive, but otherwise the dog hunts out so we do not have to walk over every possible place where there might be birds, as would be the case with a boot polishing dog. When I cannot walk to a dog on point then I guess I will quit upland bird hunting, but until then I remained thrilled to do so. I also find pointing dogs more relaxing to hunt with vs a flushing dog, which I think favors aging hunters. FWIW I hunt behind a GWP but that has a lot to do with using the dog for Upland, Waterfowl and Blood Tracking. If all I hunted was upland birds I would likely have an EP or GSP and let them roll until they found and pointed birds. Where birds are thick that will not be too far away, where they are sparse it will be farther but either way I get to see my dog point birds and probably get to shoot some as well. And if birds are sparse then wearing myself out walking behind a boot polisher does not accomplish anything as the alternative. Best of Luck with your next dog. averageguy wrote: I love pointing dogs, so that is what I hunt behind. I think it is a commonly heard misnomer that as we age we need slow close working dogs. I disagree with that completely if the intent is hunt wild birds. I think we need broke dogs which find, point and hold birds until we arrive, but otherwise the dog hunts out so we do not have to walk over every possible place where there might be birds, as would be the case with a boot polishing dog. When I cannot walk to a dog on point then I guess I will quit upland bird hunting, but until then I remained thrilled to do so. This is my choice also. A lot of good posts here. After deciding if you want a flushing or pointing dog, you go from there. For a pointer, I recommend a French Brittany, compact hard working and known for their close work. Very good dogs at home too. Geeze folks I wish you people would put a state for your location. When someone posts I often wonder where they are located. Perhaps if uncomfortable about posting town at least a state could possibly be included. Max2 wrote: Geeze folks I wish you people would put a state for your location. When someone posts I often wonder where they are located. Perhaps if uncomfortable about posting town at least a state could possibly be included. He's in Alberta. He posted that. I would think a pointing dog would be easier to follow than a flusher. Spaniels move pretty quick. A lab might be ok.
Zebo wrote: Looking for recommendations, I hunt rough grouse and released pheasants in Alberta Canada. I have had labs, Springers and a disastrous time with a gsp. I was looking at cockers,puddlepointers or pointing labs. I'm a notch off 60 and Location is Scotland. If the Post heading is to indicate you are not physically fit enough to walk miles on ground cover that is thick or climbing or in harsh weather ,then any breed will do if it has a good coat , walks to heel and steady to shot from you and will retrieve to you . Zebo, I'm nearly 73 and I want you to consider this. If you have a flusher, YOU have to cover all of the ground a flusher does. If you have a pointing dog that runs to objectives, HE covers the ground for you and you walk up and shoot the birds. Let me give you an example. We were hunting some rolling prairie a couple years ago and ahead of us about 1/4 mile was a damp pothole, loaded with cattail. The Draht spotted it and took off in a straight line for it, then hunted it. There were no birds there. My friend, Gary, and I were standing on a hill and he said "That really is an old man's dog isn't she?" I prefer the dog cover the ground and find the birds while I observe then shoot. The older I get, the more I observe. On the other hand,there have been times when my pointing dog pinned a bird in some thick brambles when I wished I had a flusher. Maybe a Dachshund..
gonehuntin' wrote: Zebo, I'm nearly 73 and I want you to consider this. If you have a flusher, YOU have to cover all of the ground a flusher does. If you have a pointing dog that runs to objectives, HE covers the ground for you and you walk up and shoot the birds. Let me give you an example. We were hunting some rolling prairie a couple years ago and ahead of us about 1/4 mile was a damp pothole, loaded with cattail. The Draht spotted it and took off in a straight line for it, then hunted it. There were no birds there. My friend, Gary, and I were standing on a hill and he said "That really is an old man's dog isn't she?" That's interesting. 71 now and my setter is almost 13 so I've been thinking about the next dog too. I was going to get a spaniel but may have to rethink that. I have to second Gonehuntin and Sharon on this one. I'm 72 and have been hunting behind a Setter and A Chessie for the last 5 years and, verified by GPS, I've found that while hunting wild upland birds I walk about 35% less behind the pointing dog than the flusher and encounter closer flushes and shoot more birds with the pointing dog than with the flusher. Not because the flusher finds fewer birds but because the flush frequently takes place before I'm in position to shoot or am too distant for a good shot. I have a Brittany she runs big. No Huge in open terrain. But she is very intelligent. When hunting and she smells a covey of birds ahead she stops and looks back to me with a stance, almost a point that I know she has birds ahead. Chucker hunting in steep terrain, she knows to wait for me about every 20 yards. I use a tracking collar and she does not budge on point. Will work about 100 yards out in heavy brush. I am 76. Thanks for some great insights everyone . I am mid fifties with my first dog a Brittany that likes to range out there. I really like hunting pheasants with him. I was wondering what to do next time and this thread has provided a lot of good information. I have to say that this thread has given me some new heroes. CJ Hills and Art Hubbard are apparently hunting hard at 80+. Clearly pointing dogs are good for you. I didn't realize that either rof you gentlemen were my age. Just turned 85 last month. Good grief, they should re-name this "Geriatric Forum", not Gun Dog Forum. Glad I'm still so young. ezzy333 wrote: I didn't realize that either rof you gentlemen were my age. Just turned 85 last month. It is good for we young fellows who, after all, represent the future of birdhunting to interact with you older gentlemen. I am a dynamic 70. Ten years ago when my sainted male Gordon passed away, I was without a dog for the first time in 39 years. I do not recommend it. My new (and non-dog-person) wife kept on saying it was "a good time to work on our relationship". I didn't know what she was talking about. I wanted a dog! And I got a fine one. a GWP. And then, later, another. I'm 72 and this post is exactly along with my thinking. Since I can't cover the ground like I use I want a dog that will cover more ground for me. Not a boot licker. I have a big running Brittany. If you have a pointing dog as you are get older, I fail to understand why you would want a closer working dog except maybe for the grouse woods. Zebo is Long gone in February ! Just leaving the rest to pontificate. Now that in it'self determines the posters replies, never mind the state. With all due respect , there is absolutely No person on earth at the age of you guys hunting any breed in cover or terrain in the grounds that certain breeds are capable of or best suited for ,for that game quarry at that time of year in that state /country if it requires a level of fitness that most 25 year old's have a heart attack . The best breed for the OP is 'anything' . Just train it to work in the environment you are in for the requirements you can work with ,to fit your ability . In general I have to agree with the above...... and Robert (Polmaise) and I have been known to disagree ! A few health problems hit me some years back and for me now, where gundog training and working them is concerned, it is very much a case of " The older I get the better I was !" I just cannot do the walking etc. that would take me up and over hills or through thick woodlands at any speed. I have always had a strong liking for dogs that really "go" and a strong dislike of "potterers." When judging trials for the versatile breeds some years back I was famous for telling the competitors just prior to the trial that if, during their dog's run, I had time to yawn and scratch my backside then they wouldn't be likely to win ! Last week I took my daughters 13 - 14 weeks old GSP pup onto the shooting estate I often work on...... I had trouble keeping up with him ! He was into everything, he went through , under and over the fairly thick cover and all the fallen trees and he even crossed the 30 feet wide stream because he'd seen my lab and my springer over on the far side. There is about a two foot high drop down from the bank into the stream but not even that stopped him from getting where he wanted to go. I felt tired just watching him but he brought a smile to my face with his enthusiasm for life . I only got about 100 yards along that stream before I had to sit down on a fallen tree and just let the dogs and the pup do their own thing but I really enjoyed my mornings short walk. Pups help keep you young at heart and I'm taking the GSP pup back to the estate today for more of the same. No matter how old you are, if you can still walk - even with a cane- get some kind of dog. They make you get up and go at least a couple times a week and a pup more than once a day. Otherwise I'd be sitting on the couch yelling at Trump. ...... and I'm Canadian. OP( Zebo ) Early 60s and healthy ? Get what you want and enjoy. Hmmm How have you judged me? Never mind, I don't want to know. When I've had enough, I call the dogs in and we go home . 13 year old can't go every day. Would be at least 4 miles - there and back. Quit yelling at my President; he can't understand Canuck anyhow! On the days I don't feel like walking, I ride a bike, the dog's run to the front and sides. That's my favorite way to exercise them. I can go faster and make them go faster. The pup cruises along at 15-20. I can't keep up with her for long. Unless we're going down hill. Well, we have quite a crew of oldsters here, and I'm glad to see I'm in such good company. Last year, when our 12 yr old lab died, we got a Springer pup which will likely be our last pup. We're both 65, and hope we can keep up with the dogs for another 10 years or so. We also have two Britts (10 yrs. and 9 yrs. old), and a GSP (4 yrs. old). We try to keep fit enough to do all the walking that the dogs need. We are still involved with our local gundog club, but no longer test in NAVHDA as we did in the past. I can't imagine not having the dogs; they keep us young. I will turn 60 in August and have a 2 year old dog. I am on the fence as to whether I want to train out another pup to hunt with this one at this time. If we are Blessed with a normal useful life as a gundog, I will be 70 before I would need another one. 10 years from now my legs may be a limiting factor at that time, but the trend of wild bird populations and habitat loss might be the real limiting factor. Could be time for another Tree dog or some Beagles instead, as the public hunting area opportunities to hunt behind those types of dogs in the MW are far better presently. Has anyone had experience with started British labs advertised in gun dog magazine? I have contacted some and it sounds good. I think a few of the fellas are not responding to your particular needs and environment. I'm over here in NW Ontario (but still slightly south of the 49th) and I think I understand where you're coming from. I am sixty-six and still going strong. Every year I spend about six weeks south of you hunting birds and deer in my former home state Montana after we clean up on waterfowl here (and some years ruff grouse here if there's enough around to make it worth the drive). 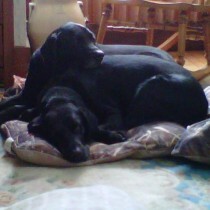 I have two black Labs and a French Brittany. Each is different and hunts differently. For the most part I don't have trouble keeping up with the little Fr Britt although it was pretty much pointless putting her in the field the past two years as there were almost no pheasants and the few to be found were extremely jumpy. A typical pointing dog really wasn't much help. Somehow I wound up with my younger Lab (4 years-old yesterday) evolving unexpectedly into a fantastic atypical pointer. She works the birds every bit as stealthily as the Britt, will go rock solid and hold till I arrive which, because she's a Lab, is always just a moment away. She was certainly the bees knees this past season in those lousy conditions. Her points aren't real pretty but they work well and she is consistent! Unlike most Labs, Ellie doesn't have to get right on top of the bird to go on point. She points equally well on sound and scent. Very unusual, especially considering she picked it up more or less on her own (or maybe from watching the Britt?). Curiously, she was a bit slow catching onto retrieving, which is weird for that breed, but she's great now (especially over water). Like the pointing, it finally just happened. Ellie was slow to develop but man was it worth it! Anyway, if you could find a Lab that will point, that might be your answer too. But be careful. I have heard some disappointing stories about expensive "pointing Labs" that were more fiction than reality. Anyway, Labs usually work very close in sight when chasing grouse and that is one of your main targets. The odd ruff that will hold a bit might get you a point but the important thing with those nervous acrobats is to be close to the dog. A rangey pointer will kill you in those conditions. My Fr Britt works close for a setter breed but not close enough for ruff grouse. You need to be right on top of the dog to make ruff grouse good hunting. My old Lab is the best medicine for them. Another thing for you to consider is your climate. Most of the traditional setter/pointer breeds are not built for cold work. A Lab would serve you well in the worst of conditions (they evolved from the St John's Dog originally bred to help bring in fishing nets in Newfoundland!). And if you ever decide to be like me and expand your horizons to waterfowl hunting (you definitely have a lot of that out there! ), then the Lab will easily make the transition. Pointers/setters not so much. And finally, pointing breeds are often not terribly reliable retrievers. That can sometimes be worked out ... sometimes with difficulty ... sometimes not. It virtually never has to be worked out with a Lab. They are truly born to do it (hence their name, Labrador retriever). Labs are less maintenance too. Every night when we're done hunting I can spend up to an hour or more cleaning burrs and seeds from my poor little Fr Britt. The Labs are essentially weed free. Once in a while they'll pick up the odd burr in their tail or sometimes collar but usually only takes a second to clean them off in the field. Cleaning up the Britt is an ordeal! Last edited by ON Honker Hunter on Thu Mar 14, 2019 2:49 pm, edited 1 time in total. Those British dogs are built more for waterfowl hunting. They are typically bulkier with shorter legs. Great disposition but I don't think the American Lab could be improved on much in that department. Just looking at one of those makes me wonder how well they would hold up in the pheasant fields. They don't seem to be designed for a lot of agility. I would prefer something more traditional in build. My younger Lab has long legs and slender build for her breed with the usual big retriever paws. She can swim like a speedboat and keep going all day when we're after uplands in Montana. Just what the doctor ordered for my kind of hunting. Now if Mother Nature will just cut us a break so she'll have some birds to chase this year. Most of my waterfowl hunting here is in the fields not over water or surf so bulkiness in my retrievers is not that important for me even when we're after geese and ducks. Big heavy dogs are more inclined to have skeletal problems like early arthritis and hip issues. And they eat a lot. But they are good looking dogs for sure. I say pick what will work best for you, not necessarily what's most appealing to the eye. Oops. I see the dialogue on this was exactly a year old. I wasn't paying attention to the year and thought it was current. Anybody know what breed he finally decided on? Thats funny i was reading right along as well and never noticed untill you mentioned it. I have a Brittany she runs big. No Huge,, in open terrain. But she is very intelligent. When hunting and she smells a covey of birds ahead she stops and looks back to me with a stance, almost a point that I know she has birds ahead. Chucker hunting in steep terrain, she knows to wait for me about every 20 yards. I use a tracking collar and she does not budge on point. Will work about 100 yards out in heavy brush. I am 76. Add on:: Nov 2018, she went on point 258 yards out. I would have never walked out to that area. 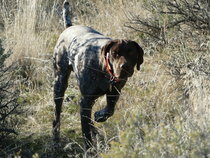 She held point on a covey of about 50 quail. Once broke up she worked singles at 30 yard range. The older I get the more I appreciate a pointing breed. They cover a lot of ground. When they go on point I catch up. It just takes longer to catch up now. All the pointing breeds have lines that are easily 1000 yd dogs, Definitely not for the faint of heart. They also have lines that are 100 yd dogs. Buy the range of dog you want. If you want a 100 yd dog don't buy a 1000 yd dog. Hacking them in all day isn't fun for you or the dog.